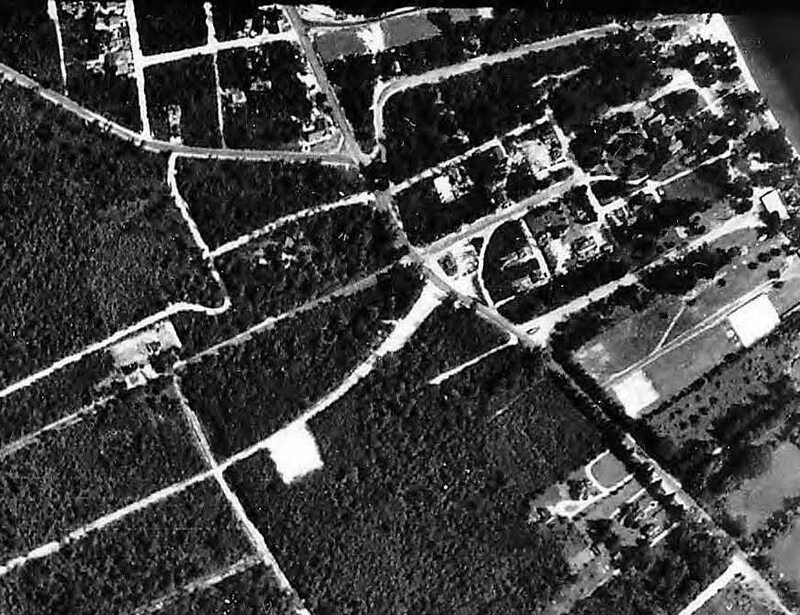 Identify the location shown in the aerial. 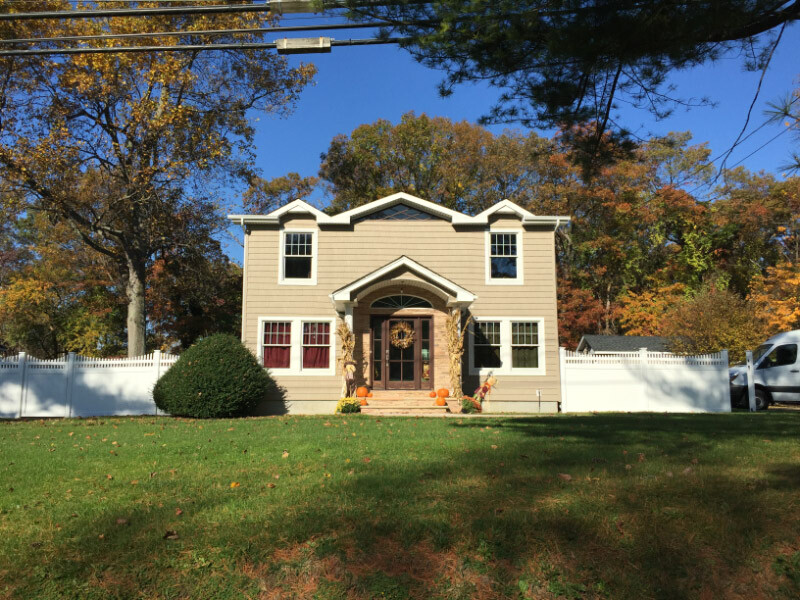 Ronkonkoma area. A sliver of Lake Ronkonkoma can be seen in the upper right corner. Ronkonkoma Lodge, Petit Trianon and the Petit Trianon Annex. Who owned the majority of the property in the top half of the aerial? What were the earlier plans for this property? 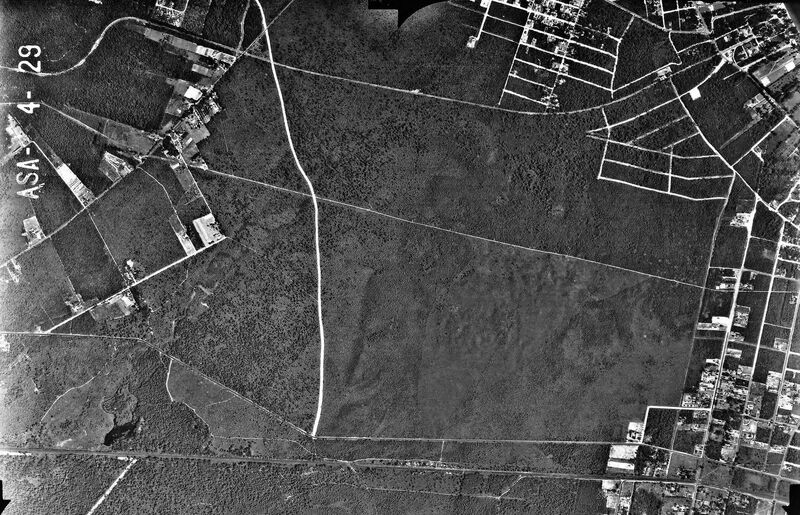 891 acres south of the Motor Parkway in this aerial were originally owned by Charles Wright. 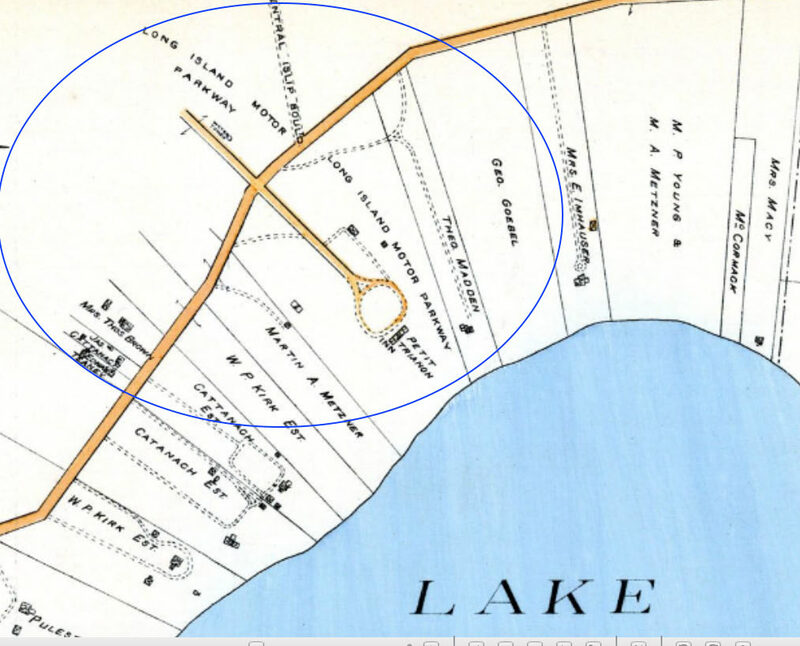 Around 1907, this property was purchased by the Long Island Motor Parkway, Inc. to connect to Lake Ronkonkoma. In 1910, plans were developed by William K. Vanderbilt, Jr. and his business associates to construct a motor speedway on this property. The plans did not go through and Long Island missed an opportunity to rival the Indianapolis Speedway with its own "Ronkonkoma Motor Speedway". In late 1937, sections of this propertywere offered for sale and purchased by real estate developer Walter T. Shirley. Congrats to Greg O. , Joe Oesterle, Art Kleiner (see Kleiner's Korner), Steve Lucas, Sam Berliner III, Tim Ivers and Frank Mendyk for identifying Ronkonkoma. Kudos to Art Kleiner, Steve Lucas, Tim Ivers and Frank Mendyk for recognizing the plans to build the Ronkokoma Motor Speedway on the property. The Long Island Motor Parkway can be seen at the top. The restored lodge building in 2016. Frank Femenias: I believe I see the lodge on the north side of the parkway, directly across from Woodlawn avenue. 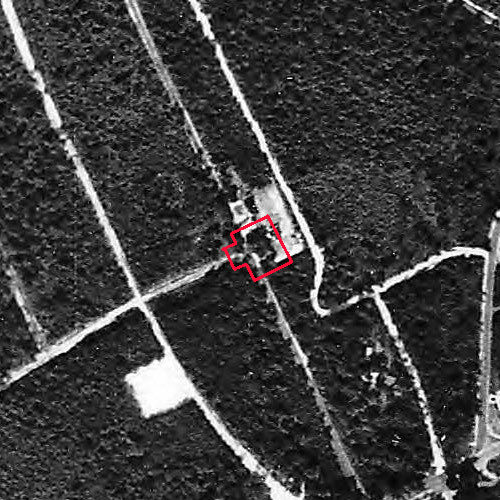 Would you say this image is strong enough evidence of the lodge's exact location? I think the white peaked roof is visible. Frank Femenias: The porte cochere over the roadway is difficult to make out but there is definitely something covering the road. I'm attempting to locate exactly where the lodge sat and there are multiple overlays involved. Frank Femenias: A closerr zoom look. Howard Kroplick: It looks like there was aprking avaialbe behind the lodge. Frank Femenias: It appears that at some date the lodge was moved 50 feet to the northwest. Frank Femenias: Acloser zoom look. "It is proposed to construct the parkway in close proximity to the lake, to build club houses, garages, golf courses, in fact to develop and make this one of the main objective points in the entire course. The company has acquired a strip of land 200 feet in width through Ronkonkoma. The extra 100 feet is to be used in connection with the races for grandstands, parking accomodations for automobiles and those conveniences and necessities demanded by the automobiling public." "...and the purchase of 900 acres there as a center for outdoor sports by the Motor Parkway Association." 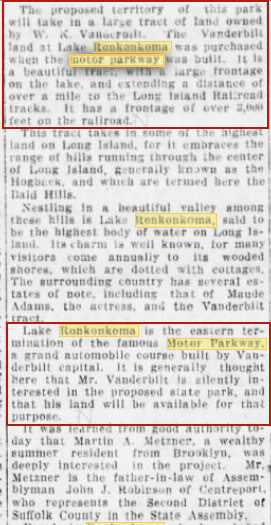 "Lake Ronkonkoma is the eastern termination of the famous Motor Parkway, a grand automobile course built by Vanderbilt capital. It is generally thought here that Mr. Vanderbilt is silently interested in the proposed state park, and that his land will be avaialbe for that purpose." Last LIMP section in Lake Ronkonkoma. Ronkonkoma lodge, Petit Trianon in view. 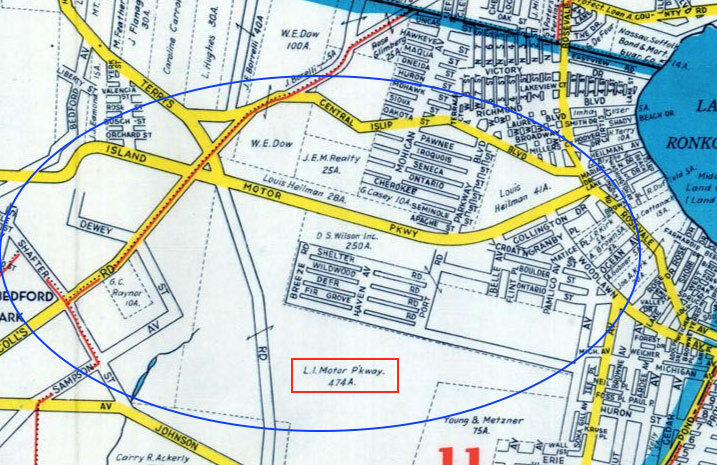 In October 1910, the Long Island Motor Parkway, Inc. tried once again to build [a] speedway. 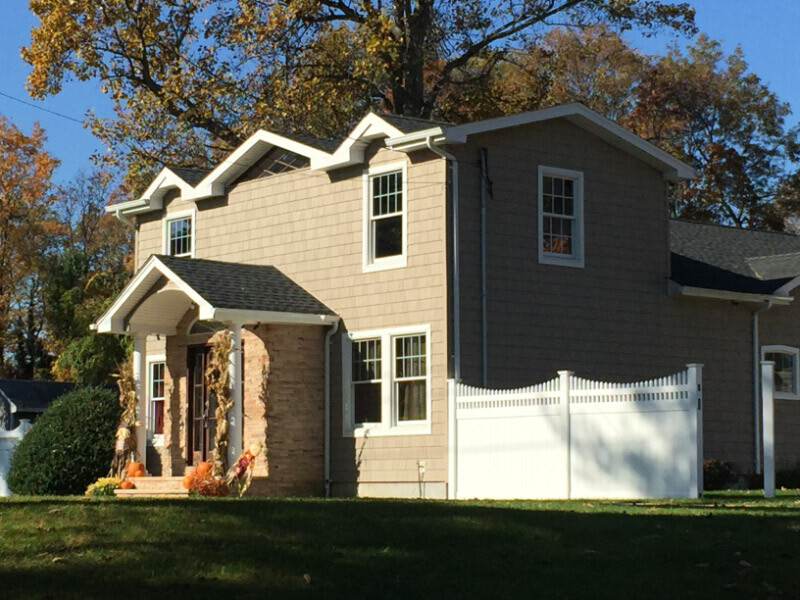 [on the above property] This time it was planned for the 891.21 acres owned by the Motor Parkway in Ronkonkoma eventually purchased by Walter T. Shirley. Lake Ronkonkoma peeks out at the far left of this picture, at the eastern end of the LIMP. The Petit Trion restaurant can be seen, along with the toll collecting station at the eastern end. Original plans called for an automobile race track and grand stands and based on a 1907 newspaper article, golf courses and garages. A few years later it was proposed to make the Ronkonkoma Vanderbilt land into a NY State Park with a $10,000 appropriate, but the motion was vetoed by then Governor William Sulzer. Again a newspaper article reported that Willie K. was in favor. Side note about William Sulzer - soon after taking office he was impeached! We are looking at an area over Ronkonkoma just slightly west of Lake Ronkonkoma, with north being at the top of the photo. I think I can see a very small piece of the lake in the upper right corner. The LIMP structures would be the Ronkonkoma Lodge, Petit Trianon, and the Trianon Annex. 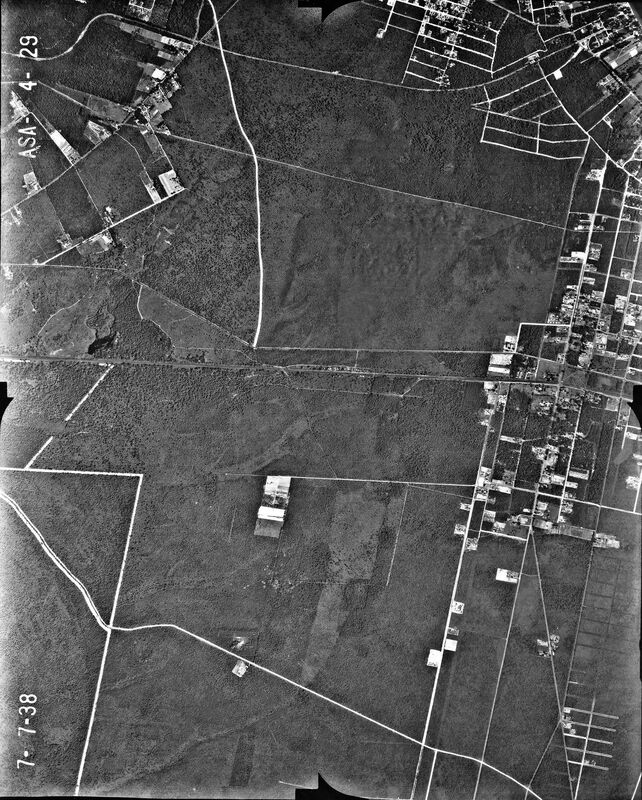 Willie K. II owned the major portion of the property in the top half of the photo through the Long Island Motor Parkway Company and had early plans to build a three loop closed course motor speedway there. at top right with a portion of the lake visible at far right. The largest portion of this property was owned by Charles Wright, and an original plan was to construct a speedway in this area but it never materialized. Walter Shirley later acquired the property which he subdivided and sold as lots. - The original 891 acres was owned by Charles Wright. 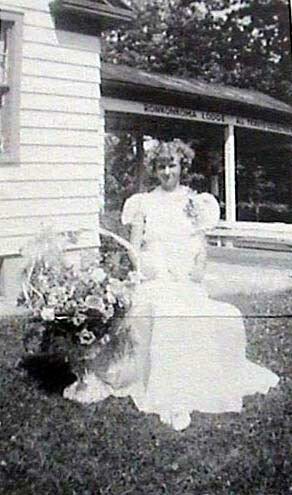 The LIMP purchased the property in 1907. 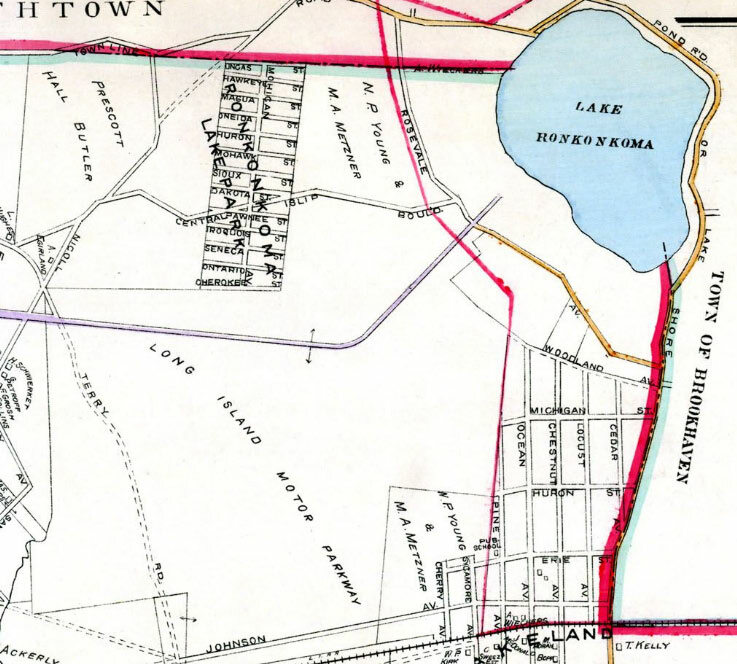 The LIMP originally planned to build a “Ronkonkoma Motor Speedway” on the property south of the parkway. 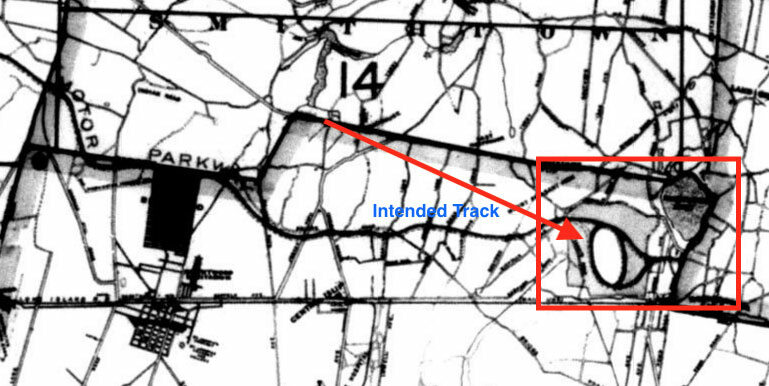 The plan for the speedway never developed and the property was then sold to Walter Shirley in 1937. Shirley then developed the area with housing. Grew up with Hagstrom maps but never seen them back in the ‘40s. Fantastic! Amazing Art!